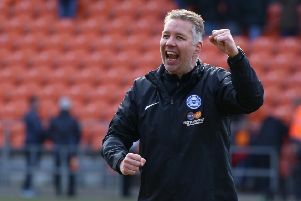 Posh fans were to quick to pay tribute to Chris Turner after news broke of his passing. Photo: David Lowndes. And Posh chief executive Bob Symns has revealed that plans are already in motion for a memorial game against Cambridge United. Turner managed both clubs. Symns also confirmed that a fitting tribute to Turner at the ABAX Stadium is under consideration, possibly a statue. Symns said: “It is now the appropriate time to talk about what we are trying to do. We have discussed a statue at the London Road end of the stadium. Turner had been battling against dementia for the past eight years and passed away in a Wisbech nursing home that had been his home for most of that time. But his former team-mates and players who played under his management were quick to remember Turner as a fun-loving personality who was the life and soul of the dressing room. John Cozens was the captain of the 1973-74 Posh team that won the Fourth Division title. Turner was the rock at the back who also scored crucial goals. Cozens said: “I haven’t been to see Chris since he fell ill purely because I wanted to remember him how he was. I’ve kept in touch with those who did visit because he was loved, admired and respected by anyone who came into contact with him. “When I first moved to Peterborough, Chris was just a kid. He was a local joker, so full of fun that he made coming to work every morning an absolute pleasure. “He used to pull stunts all the time. If your clothes had been hidden after training that would be down to Chris, but you couldn’t get at him for it as he was just so funny. Everyone loved him. “Chris was a bit ill-disciplined in his younger days, but he soon matured into a top, top player, He was a key man when we won the Fourth Division title, some-one you could rely on completely. “I wasn’t completely surprised he turned into a great manager, but his tactics as a manager were in direct contrast to the way he used to behave as a player. “He was a strict disciplinarian. If you didn’t do things his way, you had no chance of playing. When he was a player he had more ‘bad backs’ and ‘slight strains’ than the rest of the squad put together, but the players he used to manage couldn’t pull the same tricks with him. He’d see right through them! He always performed on the pitch when it mattered though. Other former Posh team-mates of Turner have commented about the great man’s passing. “A great player and person who made you laugh, always gave 100%.” - Mick Drewery.